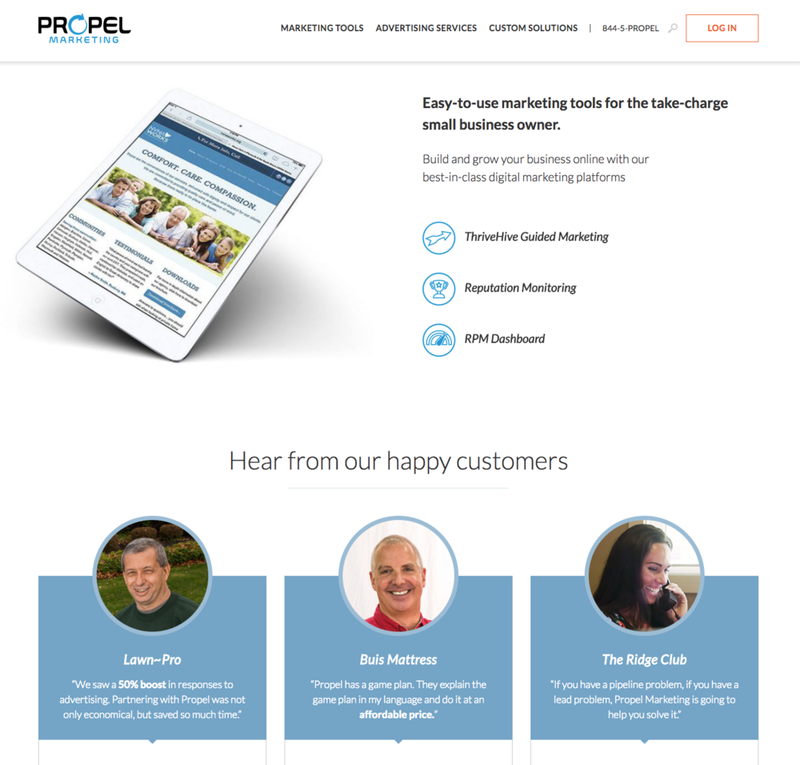 Kindred is a marketing firm whose services allow clients of any industry to expand their reach through social media. 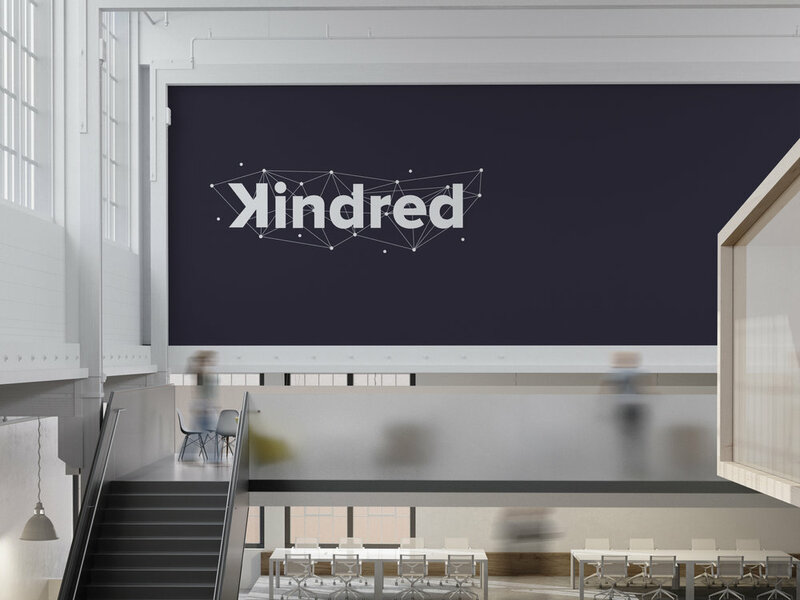 The goal for this ground-up graphic identity is to convey trust and reliability while showing clients that the minds at Kindred are not afraid to flip the script and think outside the box. Design the brand of Kindred, a social media marketing company. Deliverables include a brand guideline, logo, and applications. How can a brand be applied to an intangible product and how can the design make social media more interesting to potential clients? Before I began ideating, I wanted to expand my knowledge of other social media marketing firms and how they applied their brands and how they made it exciting. I also needed to figure out who the audience of Kindred is. I found that most of the competitor brands went in two directions. Some (ex. Taptica) went for an playful, colorful direction with imagery of internet memes, people jumping up and down, etc. Others (ex. Propel) went for a more buttoned-up approach with lots of white and gray and heavy use of stock photos of people on computers. Social Media Beast was right in-between. Insights after research: I decided to move in a direction similar to Social Media Beast with a central brand color, cool-but-professional aesthetic, and light use of photos/memes. I felt that with the large, visual differences in brands that offer similar services, riding the middle would be successful since I didn't find evidence that one visual direction attracted more clients than another. I also noticed that the sites didn't really have a lot of make a lot of effort to educate potential clients on what they do, leading me to believe that many of the clients for these sites already know the ins and outs of social media marketing. I wanted to get an idea of who would be using Kindred LLC, so I created a couple of personas and documented how they would interact the service. 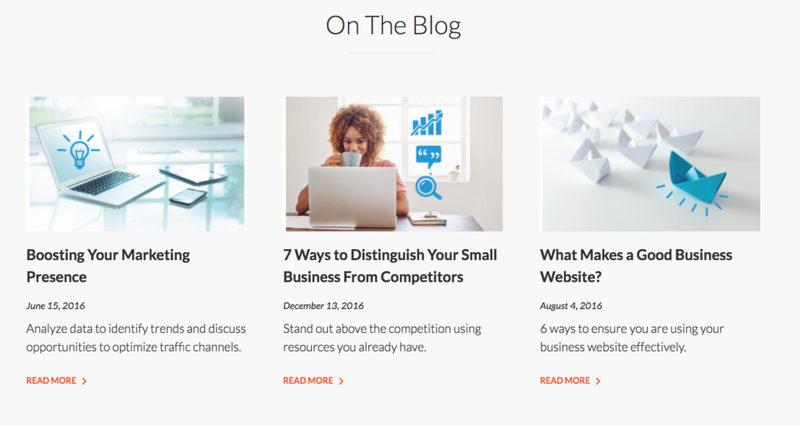 I used the competitor research to better understand how their respective clients use social media services. I wanted to understand how a client would find out about Kindred, where the touch-points are, and why the client would want to use the service based on my competitor research and chosen visual direction. Insights after research: I found that social media marketing as a service is vague in the sense of what it actually is, but specific as far as the needs of the clients. Kindred can provide many different services depending on the individual needs of the client, and in order to facilitate that connection, I figured that one of the main aspects of the Kindred brand would be through how they correspond with the clients themselves. Kindred contracts new clients mostly through referrals and the nature of their business requires very little external advertising. Therefore, I want to focus on Kindred's internal assets like stationary and the office environment. I wanted to procure a smart, cool appeal through the use of simple shapes, bold type, and youthful imagery. I wanted to avoid Facebook cliches like thumbs up, the color blue, etc. I began ideating with simple K letterforms. I wanted to experiment with negative space as well as playing with the idea of connections and webs. I felt that using type as the main focal point of the logo would convey the professional intent of the brand in a way that abstract symbols or characters would not have. I flipped the letter K and found that I could potentially use the letterform as a standalone logo as well as keep it in the word mark to convey that break-the-rules attitude. I also tried to emphasize the K in other ways too, but I felt that the flip was effective without throwing off the balance of professional and fun. I began to think about color usage and possibly adding other elements to the mark. I wanted to avoid using blue because many other social media platforms use blue in their branding. Purple can create a sense of creativity and imagination, which fit into my narrative for Kindred. I also switched to a more contemporary sans-serif typeface. I tried applying some of my color ideations to the logo. I felt like the K by itself felt imbalanced with a lot of the weight of the letterform awkwardly placed on the left side. I decided to put a period after the K to remedy that tension. The period made me think about my idea of visualizing connections and networks. I started adding circular nodes and connectors to my word mark. 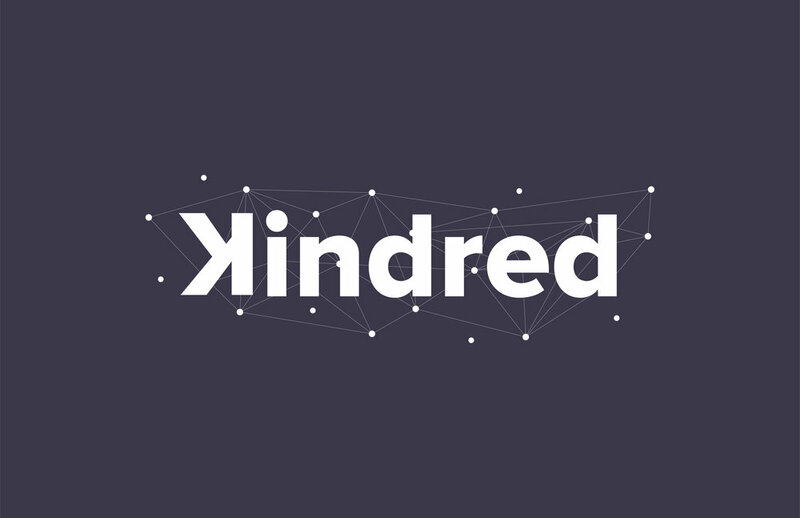 I liked the idea of these networks interacting with the logo because Kindred isn't a social network, but it facilitates users and clients interacting and connecting through social networks. Even though the logo does not need to embody every value of a company, I felt like this one did a successful job conveying everything that I wanted to convey about Kindred. The purple color symbolizes creativity and imagination, the backwards K letter lets the clients know that we are not afraid to think outside the box, the sans-serif typeface shows that Kindred is moving forward, and the network around the type is a perfect visualization of how Kindred facilitates social media interactions. There are points left floating around the network that symbolize the new connections that are waiting to be made. Clients will either hear about Kindred through a referral or through a direct letter/communication from Kindred. The stationary branding is a subtle way to market the firm through any mail we send out, any note that gets left, any pen that gets taken, etc. Everything will have the violet color pallette, the letterform logo, wordmark, or the network pattern on it somewhere. When a client comes in for a meeting or someone who was referred and curious wanders through the office, they should be dazzled by the brand presence in our office space. It really creates an atmosphere of success and cohesion. The nature of Kindred's service is very nuanced and it proved difficult to focus on the brand as a whole rather than the fine details. There was a great time investment in simply trying to understand how the company works. I also spent a lot of time researching direct competitors' visual differences rather than how their services differ and it's possible that I would have come to different conclusions if I had been able to draw a connection between the visual style and the services each brand provides. However, the final approach was able to hit all of the points in my design vision. Kindred's branding is buttoned-up and does not pull away from interesting patterns and treatments, but is not gaudy or excessive. The branding is also applied to actual client touch-points such as stationary and office interior. If I were to do a phase two of this brand, I would implement a web mockup or a mobile app.